Potassium Nitrate is the most readily available fertiliser form of potassium and nitrogen available. The nitrate nitrogen improves the uptake of potassium to the plant. Campbells Nitro-K Greenhouse Grade is suitable for application via irrigation systems (fertigation) and for foliar application. It dissolves rapidly and completely and remains in solution ready for root adsorption or is taken in via leaf surfaces. Timing of applications are suitable at any time during the season, however potassium nitrate has a special fit in the later stages of crop development, where demand for potassium is greatest. – Flower development of fruit trees and ornamentals. General fertigation rates for horticultural crops are between 25-70 kg/ha. When applying potassium nitrate through the irrigation system more frequently and smaller applications guarantee the nutrients are supplied to the plants without being lost due to leaching or excessive rainfall. Foliar applications at a concentration of 0.5-1%. 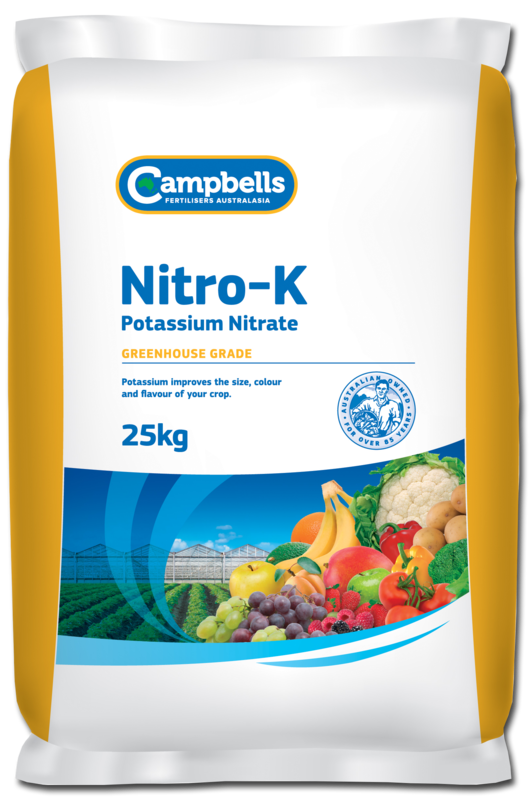 As with any fertiliser program, it is best to seek advice from your Campbells Nitro-K distributor or your local agronomist.